SINGAPORE'S challenge if it is to stay "a nation of opportunity, where everyone can succeed whatever his starting point" is to sharpen the economy's competitive edge and lift incomes. That in turn requires moving to higher quality, more productive growth which is no easy feat especially when it comes to finding the right balance on creating and filling top managerial and leadership jobs. These goals were outlined in the first addenda to the President's Address - public statements by government ministries on their upcoming plans. President Tony Tan Keng Yam's address last Friday to the 12th Parliament kicked off the second half of the Government's term. The House will sit next Monday at 1.30pm to debate the President's address, and the various programmes announced by the ministries this week. The Ministry of Trade and Industry said it would persevere in the ongoing economic restructuring effort. More than $300 million has been set aside over the next three years to help small and medium-sized enterprises. Singapore also has to ensure that workers are equipped with high-level skills to take on cutting edge jobs, such as 3D printing in the manufacturing industry. 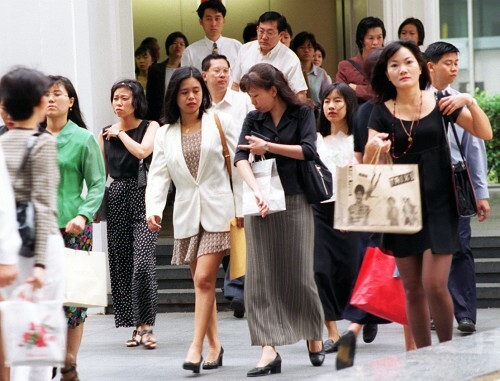 The focus will be on creating good jobs for the 40,000 to 45,000 young Singaporeans entering the job market every year for the next three years. Two-thirds of these Singaporeans aspire to become professionals, managers and executives (PMEs), as well as technicians. Meeting their job aspirations will be a challenge, especially since the workforce also needs to have "the right balance", said Second Minister for Trade and Industry S Iswaran. "We cannot just have PME jobs, we need other jobs to complement them... A larger base that supports the activities of PMEs," he said. Singapore's role as a hub for businesses in the region will boost the number of positions available for PMEs here, as companies use the Republic as a base to coordinate their activities, he added. Mr Iswaran was speaking on the sidelines of the inaugural graduation ceremony for the Precision Engineering Master Craftsman programme, held yesterday at Nanyang Polytechnic. The two-year part-time course is an industry recognition scheme that aims to boost skills of industry professionals. It is based on similar programmes in countries such as Germany and Japan. OCBC economist Selena Ling said manufacturing is no stranger to evolution and so it has "a bit of a headstart" over domestically-oriented services firms when it comes to restructuring. "Singapore has always tried to reinvent its niche in manufacturing... Most of our manufactured goods are exported, so the competition is global," said Ms Ling. "To get that competitive edge we have to identify trends before they fully emerge," she added. Singapore firms such as Express Tech Manufacturing have already begun moving into emerging areas such as 3D printing. The company, which specialises in making precision moulds for the electronics and automotive industries, has manufacturing facilities in China and Singapore which make use of the technology. Company director Leong Yoke Ming has set up a subsidiary - called Additive Manufacturing - to focus on taking it further. "Besides adding value to what we are currently doing, we also hope to break new ground in the future and diversify our business into supporting other industries, like defence, aerospace and oil and gas among others," he said.